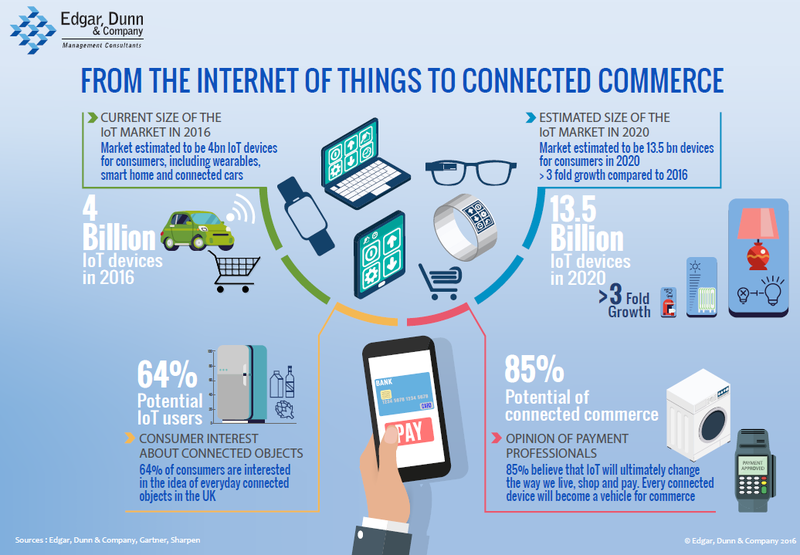 "Edgar, Dunn & Company" propose a new infographic : "From the Internet of Things to Connected Commerce". Connected objects will provide a breadth of innovative use cases. These connected devices coupled with the integration of payments will allow to expand beyond their original purpose and become true commerce enablers.” Grégoire Toussaint, Principal, "Edgar, Dunn & Company". What are the hurdles for the advent of the Internet of Things? In a previous article (http://edgardunn.com/2016/06/from-iot-and-connected-objects-to-connected-commerce), we explored how technology is transforming our lives and how the advent of the Internet of Things (IoT) will create a breadth of innovative connected objects that can become true commerce enablers. We will now explore the major hurdles for the advent of the Internet of Things and for connected objects to create a mass market. 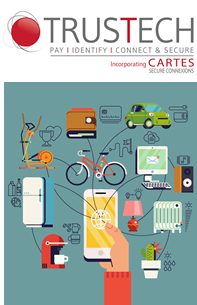 Grégoire Toussaint will chair the session on IoT and deliver the first keynote related to connected commerce at TRUSTECH Incorporating CARTES from 29 November to 1 December 2016 in Cannes, French Riviera. Join us there to discuss the evolution of IoT and Connected Commerce: www.trustech-event.com. Edgar, Dunn & Company’s latest infographic highlights the tremendous growth of consumer-related connected objects, with more than a three-fold growth between 2016 and 2020. According to Gartner’s Hype Cycle, Internet of Things is still at the top of the peak of inflated expectations, reflecting the buzz and “noise” around IoT-related opportunities. Connected objects have an enormous potential, yet to become a reality. There are still many hurdles for us to use seamlessly our smart kitchen or our connected car in a simple, convenient, useful and user-friendly way. There is a flurry of initiatives, pilots or different technologies such as Withings products ranging from smart watch to wireless blood pressure monitor. As largely discussed during last Mobile World Congress in Barcelona, the IoT eco-system remains mainly fragmented and lacks standards for interoperability and for IoT solutions to work together. APIs and data normalisation should assist for IoT systems to connect to each other and cloud-based platforms interact with one another. According to eMarketer, 63% of US consumers use 1 to 5 apps per day on their smartphone at the end of 2015 and the number of connected objects used regularly on a daily basis may also become limited. The lack of governance in this fast-evolving eco-system is also a drawback to ensure that new solutions can be integrated with different platforms and technologies. Many partnerships emerge and will facilitate inter-operability as highlighted by the recent announcement between Microsoft and Renault-Nissan related to smart cars. But additional steps need to made before improving the current situation and moving towards a more interoperable eco-system. Data privacy and security are major concerns hampering the development of connected objects. The lack of security in some connected objects like connected cameras is a major issue. The number of data breaches and the potential misuse of data do not contribute to create trust and confidence in this new eco-system. Data needs to be used with great care to avoid any “Big Brother feeling” among consumers, ensure that privacy concerns are kept to a minimum and trust is maintained with end users. 84% of survey respondents in our Advanced Payments Report think that security remains the biggest concern, even more so when sensitive financial data are involved. Connectivity and batteries are technological constraints that IoT manufacturers and solution providers need to optimise. A connected object will be of interest if it is easy to use and can connect with existing systems / devices owned by consumers without creating additional friction or pain points such as the need to charge various device batteries on a daily basis. One of the keys to unlock the potential of connected objects will be the ability to become integrated in the day-to-day life and facilitate our daily life with concrete and tangible advantages. Connected objects will also need to have the appropriate “look and feel” and design. A smart watch or connected bands will be truly adopted by consumer if design matches consumers’ taste with a high degree of customisation. This is the reason why MasterCard has partnered with Parsons School of Design to benefit from creativity and innovation and integrate design-led thinking into payments innovation. All these hurdles affect the further development of the Internet of Things eco-system. But despite these hurdles, connected objects have the capabilities to address many frictions and provide potential solutions to facilitate the purchase process. Amazon’s Dash button and Echo loudspeaker are examples highlighting concrete solutions with significant potential. 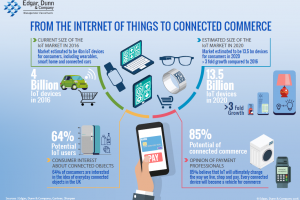 68% of survey respondents in EDC’s annual Advanced Payments Report underline the potential of connected objects and believe that IoT will revolutionise the payments industry as every connected device can become a vehicle for commerce. Connected objects will provide a breadth of innovative use cases. These connected devices coupled with the integration of payments will expand beyond their original purpose and become true commerce enablers.